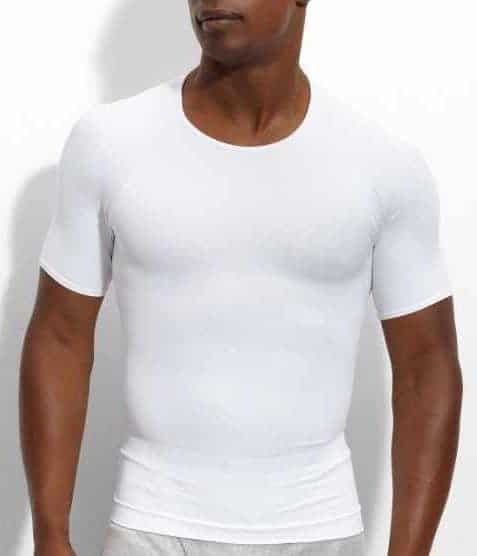 For men who are interested in men’s shapewear or body shapers to improve the look of their waist or chest, a compression shirt or tank is an easy way to get a slimmer, more smooth look. Compression shirts also have the added benefit of holding your core in place when you are working out, and they can even improve your posture. These t-shirts work well to keep in the belly, chest, and love handles without making you feel constrained. Compression shirts have been a staple of gym wear for years due to the wicking properties of the fabric, the improved circulation that occurs when wearing, and the support they provide your muscles. 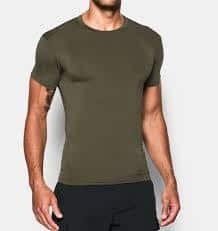 Whether your issues are with gynecomastia, wanting a slimmer look or you want extra support when you are working out, we have found the best slimming compression shirts and undershirts for men. Spanx is the most popular go-to brand for women’s shapewear, but their lesser known men shapewear line is also well worth a look. They have some very effective crew, v-neck or tank styles that will not only make men look slimmer than they are, they are also surprisingly comfortable to wear. Like other Spanx products, they can be a struggle to get on, but once on, they work very well and do exactly what they are supposed to do. The Spanx Zoned Performance shirts and tanks are seamless and have cooling vented features under the arms, and on the back, so you can wear them daily under regular shirts for their slimming features, and they shouldn’t cause you to sweat or get too hot. They also offer a Cotton Compression T-shirt and tank that is intended to be worn instead of an undershirt. The cotton styles are a little less expensive than the Zoned Performance styles but work equally well. The Spanx shirts and tanks will do a great job smoothing everything out; just make sure you follow the sizing instructions closely. The Under Armour UA Tactical HeatGear® Compression T-Shirt is mainly designed as a training t-shirt for the gym to help deal with sweat, but it works great as a compression shirt that will keep you looking trim and tight under regular clothes. It is intended to be super tight and to feel like your muscles are being held in. The fabric has moisture wicking and anti-odor properties, so it will move the sweat away from your skin so it can dry off quickly and reduce the chance of odor developing. If you are looking for a t-shirt to wear under suits to avoid sweating, this may be one to consider as it will be cooler than a regular cotton undershirt, if you do sweat it will be wicked away quickly and not show through your regular shirts. You can get this tee in a v-neck as well as the crew neck style. Leonisa has a few different styles for compression undergarments and compression wear. A lot of their stuff is the next level up from Spanx if you want more compression and toning. They have body shapers, tanks, compression tees, and waist trainers. 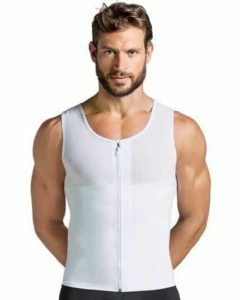 Their Men’s Abs Slimming Body Shaper is a very popular vest design that comes in three colors. It claims to help you look as though you have lost up to 2 sizes in your ab area by flattening and toning the abdomen, chest, and back. It will also help give your back support and posture correction. You can wear this body shaper every day or after you have undergone a surgical procedure and need extra support. 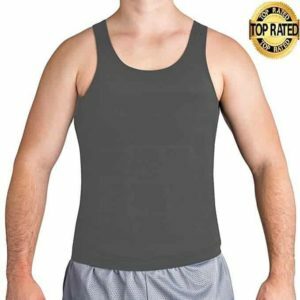 Some people find this toner vest more comfortable to put on than compression t-shirts because the front zipper opening is easy to do up and undo, even though it’s much firmer when you get it on. You have to be a little bit careful that you don’t get any chest hair stuck in the zipper because it will hurt. Men who wear this garment say that it is very tight but surprisingly comfortable. They also say that it will flatten your gut and love handles very effectively. 2(x)ist is well known for their shaping underwear, but they also have some great tees that will help keep your waistline looking slim and toned. Their compression shirts come in a tank, crew neck or v-neck styles and are made with a stretchy cotton-spandex blend fabric, that has an interior layer for a slimming effect. 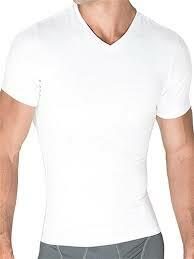 The 2(x)ist shirts will make you look very natural and trim by compressing all excesses weight or bulges. It can also help you to stand more erect while shaping the abdomen area and highlighting the chest. Like most shapewear, it’s a bit tough to get into but will stretch out a little bit once it is on. Most men find that it is comfortable enough for all-day wear. An excellent place to shop for the shapewear brands 2xist, Go Softwear, Leo and Rounderbum to compare the different styles and prices all in one place is at Freshpair.com. They have lots of different design options for whatever it is that you are looking to slim down or smooth out. 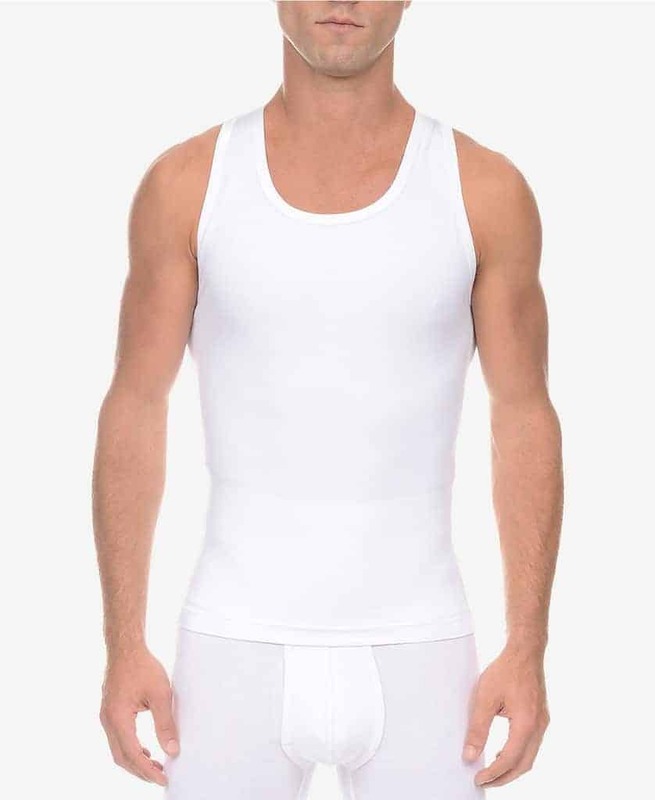 For those who are just looking for an inexpensive tank that can make you look slimmer without too much work or effort, you should check out the Roc Bodywear Men’s Compression Slimming Shirt. This undershirt tank is light, breathable and comfortable to wear. It doesn’t have the most robust compression but gives a little bit of toning while still maintaining flexibility and comfort. If you are unsure if a compression shirt is right for you, this may be an excellent garment to start with since the compression is pretty light, but it will give you a slimmer effect. If you find you like the results of wearing this type of tank you can move onto higher levels of compression that you would see in more expensive brands. It is slightly thicker than a regular tank top so that you might sweat a little bit in warmer weather. If you are dealing with gynecomastia, this is an excellent product to try without feeling too constricted. 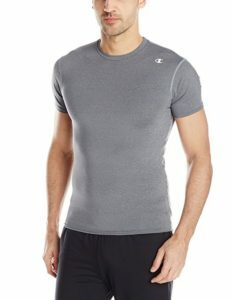 Another inexpensive option is the Champion Men’s Double-Dry Compression Shirt. This shirt designed for working out due to its high wicking properties, but it also works well as a replacement for a regular undershirt to help you slim down the look of your torso. The fabric is an 84% polyester and 16% Spandex blend fabric with the polyester providing the wicking and the Spandex helping with the compression. Men love this shirt to wear under a slim fitting shirt if you have any extra weight in your chest, stomach or love handle area, as it will help to slim it down. Most men find it to be comfortable enough to wear all day. It is a good, less expensive alternative to the Under Armour style listed above, although it has slightly less compression, so it isn’t such a tight fit style. Compression shirts are tight and constricting. Most of the time the fit is going to be skin tight, wearing a skin-tight skirt is different than a loose cotton tee, and so you need to be able to handle the feel of it being tight. Some shirts will be more comfortable than others, so you may have to shop around until you find the right level of comfort and tightness for you. Look for styles that are breathable and not too hot. Some of the cheaper shirts may have fabrics that don’t breathe quite as well as their more expensive competitors. Getting a style with a breathable fabric will go a long way toward how comfortable you find the garment. Riding up– Undershirts can be a real pain if they ride up at the waist or on the arms. If you have trouble with styles riding up at the waist look for longer shirts that you tuck in or that will give you a bit of extra material to stop it from riding up. If you have trouble with sleeves riding up, you may want to consider a tank option overall though; these compression shirts should ride up much less than the traditional cotton undershirts. They take some getting used to. It does take a little bit of time to get used to compression shirts because for them to work, they need to be tight. If you aren’t used to a tight fit, you have to kind of ride it out for a while, and you will eventually start to get used to the feel. Getting them on and off. If this is your first time trying out compression shirts, you may be a little shocked at how difficult they are to get on and off. The control these shirts provide also makes it hard to get into, especially if you go for a smaller size. Once on, they will stretch out a little bit but do not, whatever you do, try to put on right after a shower. Posture and back support. 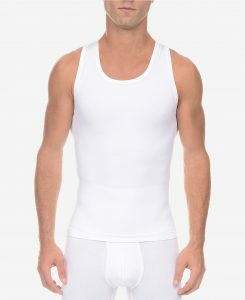 If you are looking for men’s shapewear to trim the look of your torso a nice side effect is that it improves your posture and will provide lower-back support. If you have a big event you need to look good for, or you have gained a little weight and want a bit of a confidence boost, a compression shirt or tank is an easy way to trim a few inches and to smooth out your look. They are also great to wear to work out or during other physical activity to lessen the strain on muscles.